As Yogi Berra used to say, "It's like deja vu all over again," but Wednesday's betting outcome in the Villanova-Creighton game was no laughing matter for those who had Wildcats tickets, as they were sucked back in during overtime only to have their hearts ripped out at the buzzer. As Yogi Berra used to say, "It's like deja vu all over again," but Wednesday's betting outcome in [the Villanova-Creighton game](http://www.espn.com/mens-college-basketball/game?gameId=401083235) was no laughing matter for those who had Wildcats tickets, as they were sucked back in during overtime only to have their hearts ripped out at the buzzer. Of course you remember what happened in Monday's Iowa State-Oklahoma game, when the Sooners hit a meaningless 3-pointer at the buzzer that shouldn't have counted [to cover the 3-point spread](https://www.betchicago.com/college-basketball-bad-beat-iowa-state-bettors-crushed-oklahoma-feb-4). Well, it appears it's happened again -- at least to some, depending on what line they got Nova. And in an intruiging twist that has gambling Twitter up in arms, referee Roger Ayers was part of the officiating crew in both games, though he only made the call on the final shot in this game. Gary Maxwell [made the incorrect call](https://twitter.com/BettorIQ/status/1092637267049369601) on Monday's buzzer-beater. 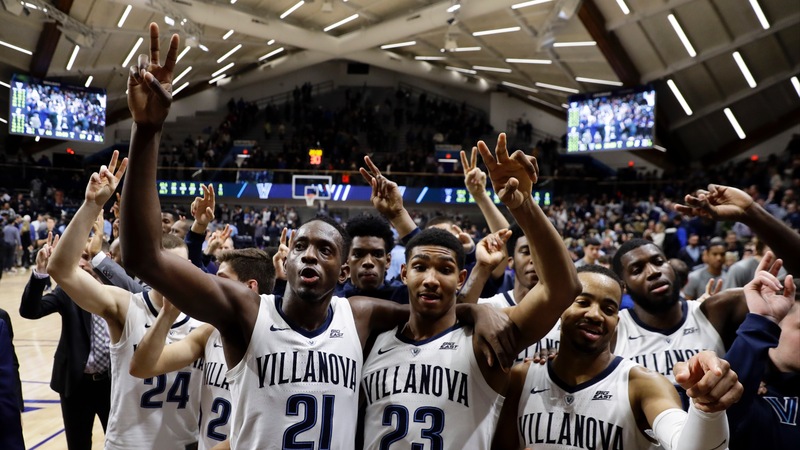 ## Villanova-Creighton bad beat The 14th-ranked Wildcats beat the visiting Bluejays in overtime (more on that in a second), 66-59. Villanova closed as 10.5- or 11-point favorites, so if that's what your ticket said, you were cooked, anyway. But the Wildcats (19-4), who've won 11 straight (and seven in a row against the spread), opened at -9, or even 8.5 [at some places](http://www.vegasinsider.com/college-basketball/odds/las-vegas/line-movement/creighton-@-villanova.cfm/date/2-06-19/time/2000#AA). And in this case, those were key numbers, as Creighton's Kaleb Joseph hit a runner that, like Monday, appeared to have been taken after the clock ran out. __MORE:__ [Buy or sell Iowa State to win the title at 40/1? ](https://www.betchicago.com/ncaa-tournament-2019-odds-ap-top-25-rankings-buy-sell-iowa-state) | [Weekend bad beats](https://www.betchicago.com/college-basketball-bad-beats-late-foul-villanova-purdue-cedes-meaningless-layup-in-top-25-blowouts) <a href="https://twitter.com/BWCPicks/status/1093348432062963712" class="embedly-card" data-card-width="100%" data-card-controls="0">Embedded content: https://twitter.com/BWCPicks/status/1093348432062963712</a> Here it is in real time so you can be the judge... <a href="https://youtu.be/nPH1eN4T1aY?t=458" class="embedly-card" data-card-width="100%" data-card-controls="0">Embedded content: https://youtu.be/nPH1eN4T1aY?t=458</a> Oof. The crazy part for most Villanova bettors is that most of them (like myself) probably turned the game off, since the Wildcats' largest lead in the second half was only four and they scored just four points in the final six minutes as the Bluejays forced overtime. But an 8-0 Villanova run in O.T. made it 60-52 with 22 seconds left. Wildcats reserve forward Dhamir Cosby-Roundtree then missed the second of his two free throws, and Creighton's Davion Mintz made a layup to make it 60-54 with 17 seconds to play. Phil Booth hit two free throws to put Villanova back up eight, then got a steal and tossed ahead to Eric Paschall for a dunk and a 64-54 lead with 10 seconds left. A backdoor cover was still very much in play, and it looked to come to fruition when Mintz hit a 3 with three seconds left to make it 64-57. But Creighton's Connor Cashaw still decided to foul. Cosby-Roundtree hit two free throws (the first bouncing high off the front rim and in) to make it 66-57, which was good news -- albeit very briefly -- for those with Villanova -8.5, or even -9 thinking a PUSH was possible. There seemed to be some confusion after the bad beat-clinching basket among the refs, who've been programmed to go to the monitors after every close play. But when they realized it didn't matter to the outcome, Ayers simply signaled the basket was good and everyone went about their night. Rip those tickets. Here's a sampling of reaction to Ayers being involved in two similar bad beats in the same week: <a href="https://twitter.com/SuperiorPicksU/status/1093356013443526657" class="embedly-card" data-card-width="100%" data-card-controls="1">Embedded content: https://twitter.com/SuperiorPicksU/status/1093356013443526657</a> <a href="https://twitter.com/davecokin/status/1093388585804324866" class="embedly-card" data-card-width="100%" data-card-controls="1">Embedded content: https://twitter.com/davecokin/status/1093388585804324866</a> <a href="https://twitter.com/CFBRefStats/status/1093366334342266880" class="embedly-card" data-card-width="100%" data-card-controls="1">Embedded content: https://twitter.com/CFBRefStats/status/1093366334342266880</a> But there seems to be hope ahead for bettors when it comes to "meaningless" end-of-game plays. <a href="https://twitter.com/DavidPurdum/status/1093566062287818752" class="embedly-card" data-card-width="100%" data-card-controls="1">Embedded content: https://twitter.com/DavidPurdum/status/1093566062287818752</a> Just not in the regular season. 🤷 __PLAY:__ Our free [College Hoops 3-Pointer: Spreads and Totals](https://betchicago.chalkline.com/games/college-hoops-pick-3-spreads-totals) contest. Get the spread and total right in three college games to win a BetChicago prize pack.